When I flipped to the February drawing for my 2016 "Twelve Months of Fresh Food" calendar I was surprised to see turnips. 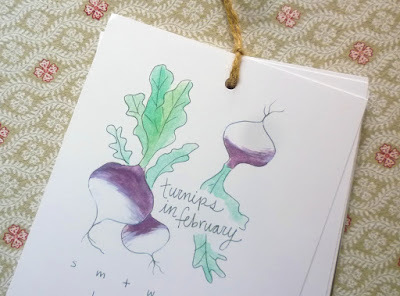 It is not that turnips are not in season right now...they are in fact in season in their capacity as a winter storage vegetable. 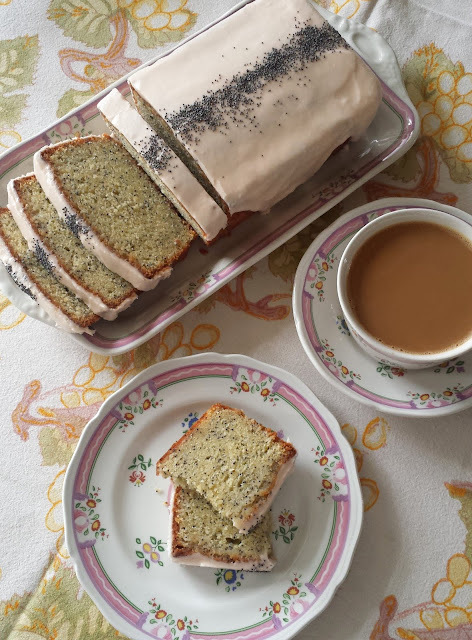 My surprise was mostly because in recent years I have come to think of them more often as a young, tender root from the farmers' market during the cooler early and waning days of the growing season. In that capacity, they are delicious raw (in a salad)......or lightly braised in butter (as a vegetable side). But it was nice to be reminded of them as one of the wonderful root vegetables that make up the winter pantry. In that role, their pleasantly bitter edge can add depth and complexity to winter soups and stews as well as vegetable purées, gratins and side dishes. I was glad to have a reason to purchase some this month (we all get into our own little culinary ruts sometimes...). Like most storage vegetables, you have to be careful when you purchase them to make sure you don't get a hold of a specimen that has been improperly stored...or stored too long. Storage turnips will almost always look a bit scuffed or marred...but they shouldn't be deeply scratched or gouged (they will decay rapidly where the skin has been broken). They should be firm and heavy for their size as well. If they feel light they will be dry and pithy or spongy. Alice Waters in her book Chez Panisse Vegetables mentions that you should avoid storage turnips that have begun to re-sprout as they will have become woody. I would imagine that they would also be excessively bitter at this stage. When you get them home, store them in an open plastic bag in the vegetable drawer of your refrigerator. 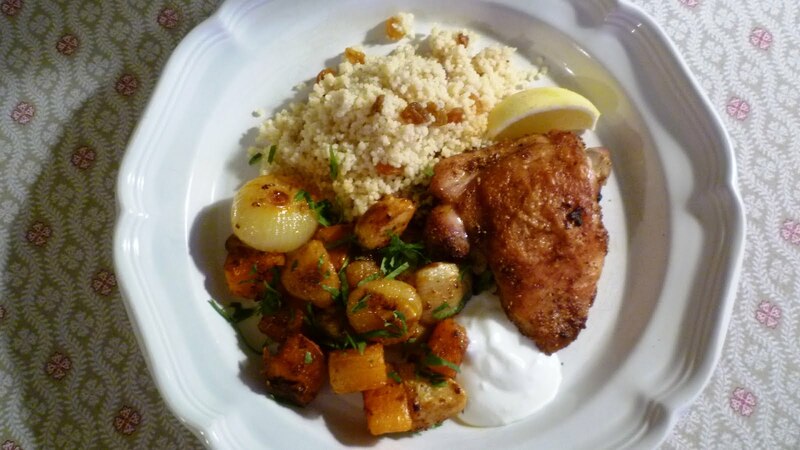 For my winter turnip recipe I'm sharing a Spicy Moroccan Roasted Chicken dish. 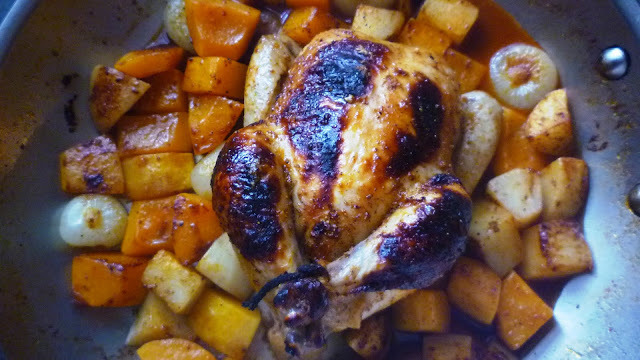 The recipe is an adaptation of a Cornish Hen recipe that I have been making (and teaching) for years. I had a couple of reasons for changing it. 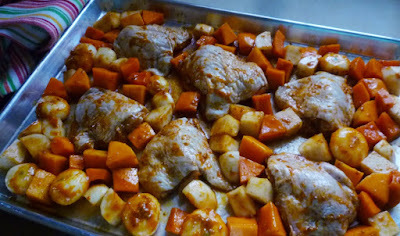 For one thing, I like Cornish Hens...but I love chicken thighs. But more importantly, the chicken thigh version is a bit more streamlined...and my goal in posting this recipe is to encourage people to try turnips. Having to truss, baste, carve, etc. might put people off. I am including the adjustments for the Cornish Hen version in the notes at the bottom of the recipe though, for those who want to try it. 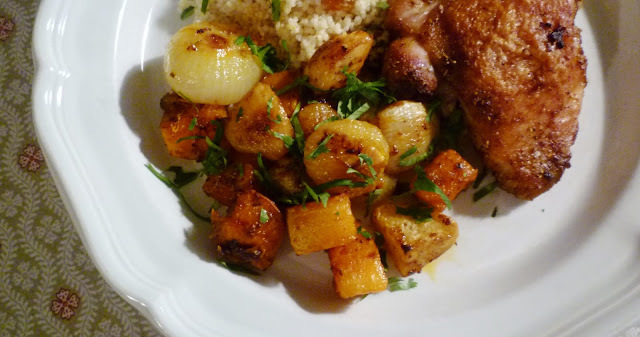 In addition to chicken thighs, turnips and a lively blend of Moroccan spices (cumin, coriander, caraway, paprika and cayenne), this dish includes sweet winter squash and cipollini onions—both of which temper the heat of the spices...and any bitterness in the turnips...nicely. 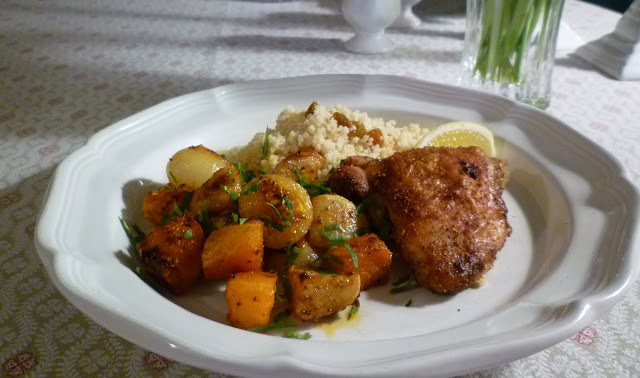 I add more sweetness by serving it with a cinnamon scented couscous studded with golden raisins. If you are in the mood for a lighter meal, a fluff of arugula dressed with lemon and olive oil would make a great side too. If you have never liked...or never tried...turnips, you should give them a chance in this recipe. They add great flavor...without being overpowering. Once you've tried the turnips in this dish, you will probably want to try them in other ways. You might sample them in a hearty and traditional Guinness stew...perfect for St. Patrick's Day (which is just around the corner)...or in a rich and creamy gratin with sweet potatoes and Yukon Gold potatoes. Whether you try these...or some other....recipes, I think you will soon find that there are many ways to prepare this oft neglected vegetable of the winter months. If time permits, salt the chicken 12 to 24 hours ahead. Use up to 3/4 t. of kosher salt per pound of chicken...I find a teaspoon of kosher salt for 1 1/2 lbs of chicken to be about right. Cover and refrigerate. Place the spices in a dry sauté pan over medium-high heat, shaking occasionally, until fragrant. Transfer to a plate to cool. Grind in a spice grinder or with a mortar and pestle. (If whole spices are not available, just use ground spices.) Combine the toasted spices with the paprika and cayenne in a small bowl with the olive oil and lemon zest; set aside. In a large bowl, toss the vegetables with a teaspoon of kosher salt and pepper to taste. Pepper the chicken and add it to the bowl. Drizzle the spicy oil over all and toss until everything is well coated. A wide rubber spatula or your hands work great for this. Spread the vegetables and chicken (skin side up) on a lightly oiled rimmed sheet pan, distributing everything evenly. Place the pan in the oven and roast, stirring the vegetables and basting the chicken with the pan juices two or three times as they roast. Because all ovens are different, you will have to watch carefully to make sure that 450° is the right temperature for your oven. You want everything to be cooking at an active sizzle. If after 20 minutes nothing is happening, increase the temperature by 25°...if things are snapping and popping aggressively...or smoking, reduce the oven temperature by 25°. Continue to roast until the thighs are cooked through (juices should run clear) and the vegetables are tender and golden brown—about 45 minutes. 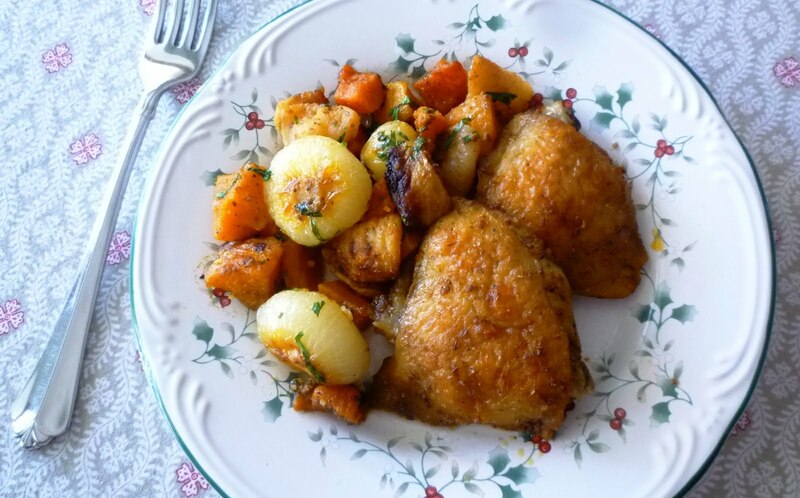 Variation for Cornish Hens: Replace the chicken thighs with two 1 1/4 to 1 1/2 lb. Cornish Hens. Reduce the oil in the spice mixture by a tablespoon and add a tablespoon of honey and a tablespoon of lemon juice to the mixture. Season the hens (12 to 24 hours ahead, if time). Stuff a quarter of a lemon in each of the cavities and tie the legs together with cotton twine. Toss the vegetables with salt and pepper, add the Cornish hens to the bowl and pour the spice mixture over all, tossing to coat everything thoroughly. Place the hens and vegetables in a shallow baking dish just large enough to hold the hens and vegetables in a snug single layer. Start the birds in a 475° oven. Roast, basting the birds occasionally with the pan juices. After 20 minutes or so (when the birds have begun to take on a deep color), reduce the oven temperature to 400° and add 1/2 cup of water to the roasting pan. Continue to roast until the birds are fully cooked (juices should run clear) and the vegetables are tender and golden—another 20 to 30 minutes. (If at any time the pan juices become dry, add more water.) Keep the vegetables warm while you rest the birds (at least 10 minutes). Cut the birds in half and serve one half per person.